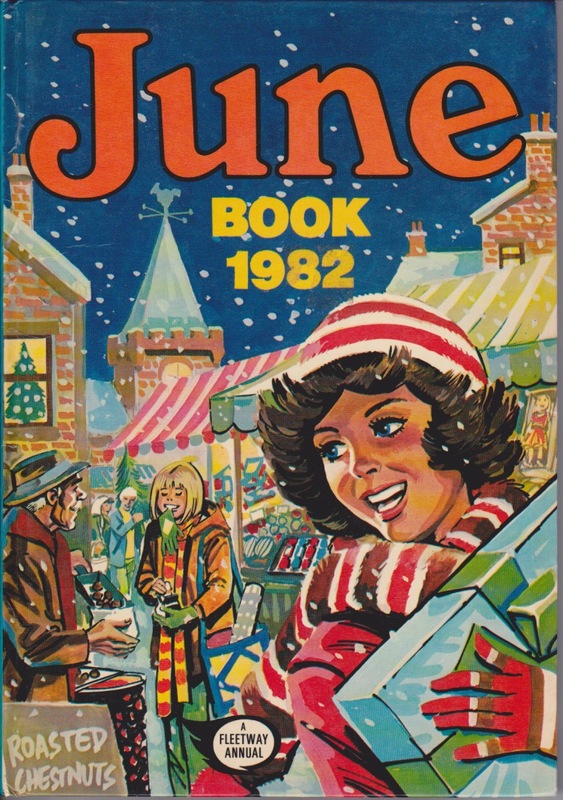 I see that June called its Annual a ‘Book’ instead! There is no dedicated internet source that I can find for discussion of June (though of course the Comics UK Forum covers this too); I hope everyone will forgive my inclusion of this ‘Book’ under the Jinty banner. June is not a girl’s paper that I know well, but I have been interested to read this annual in the light of now knowing that it is a direct precursor to Jinty: Mavis Miller was the editor of June & School Friend before being moved onto Jinty, seemingly as part of the general move of the time to pep up girls comics and make them sharper and less old-fashioned. 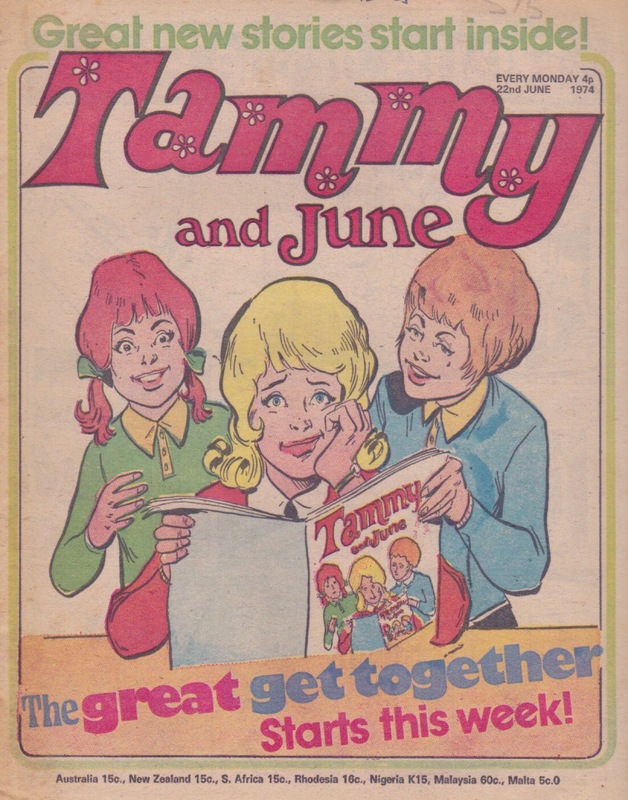 (Around the time that Jinty was being prepared, June was merged with Tammy, which would be another reason to move the editor on.) 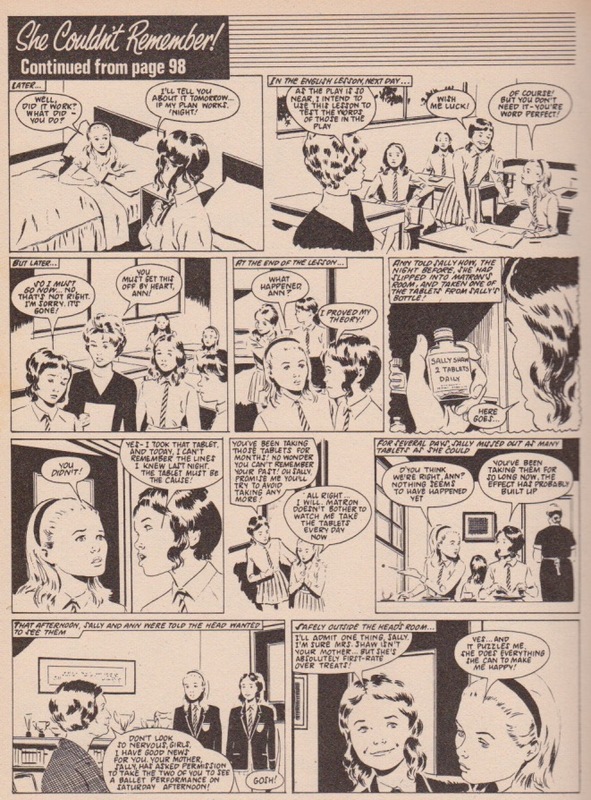 We already know of some overlap in creators and themes between June and Jinty: “Nobody Knows My Name”, written by Alison Christie, was published in June under Mavis’s editorship. 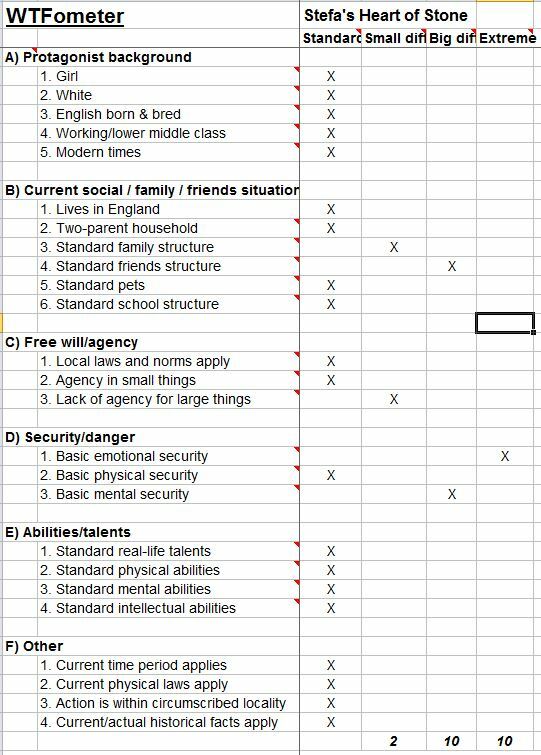 Looking at this Book, we can see even more overlap, and some interesting areas of difference too. The annual starts off with a nice little animal story drawn by Trini: little Italian girl Nella is invited to be a bridesmaid at a posh society wedding; her pet donkey ends up saving the wedding presents from thieves. The art is beautiful, as always, and the story is sprightly and fun. It’s a story that would have fitted well into any Jinty annual, too. The first text story, “House of Phantoms” has given me a bit of doubt: looking at the illustrations I am still not totally sure whether they are done by Comos or Freixas (who I hadn’t previously thought of as particularly hard to tell apart). The mouths are quite similar. On balance I am plumping for Freixas but am interested to hear other views! The story itself is exciting and dramatic (if very stereotyped in its portrayal of made-up South American countries) – not quite long enough, though, needing a few more twists and turns. 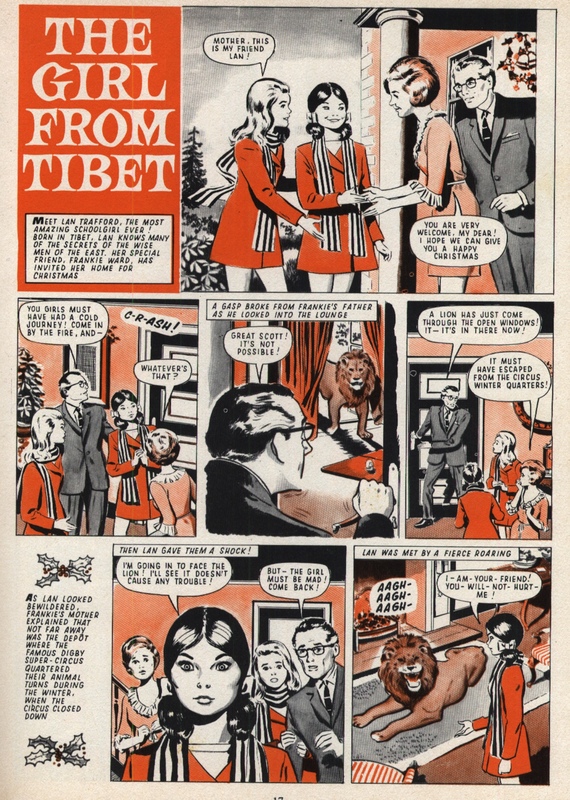 “The Girl from Tibet”, drawn by John Armstrong, is slicker than his later style. There is little dramatic tension though, because the title lead is clearly a bit of a supergirl who can do anything, so when she defeats the rather mimsy villain, it comes as not much of a surprise. 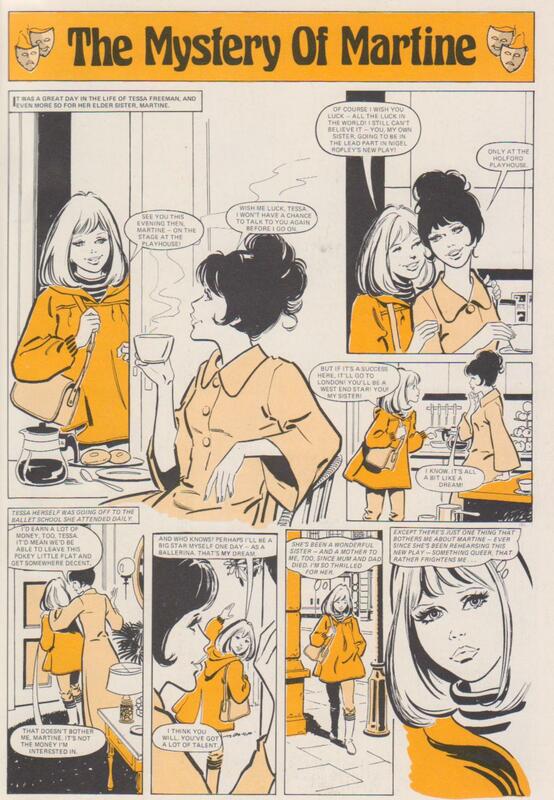 “Jeannie’s Unearthly Twin”, drawn (and signed) by Freixas, is very stylish; the story itself is a straightforward humorous ‘magical companion’ story à la “Vanessa From Venus”. 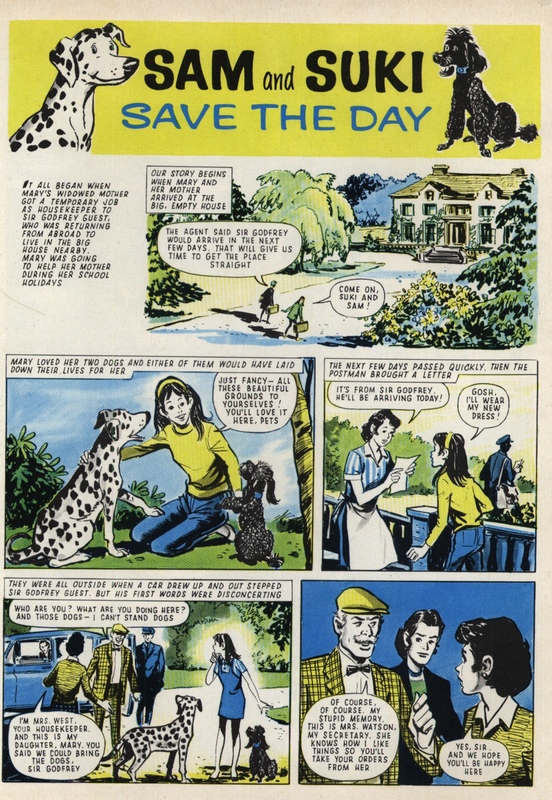 And finally, “Sam and Suki Save The Day” is by Robert MacGillivray, in a slightly less cartoony style than he used for “Desert Island Daisy” in Jinty some years later. He is an artist I am coming to appreciate more as I see a wider range of his styles. So, what similarities and dissimilarities do I see in this June Book, compared to Jinty? Clearly there is an overlap between these final years of June and the first year of Jinty in terms of artists (MacGillivray, Townsend, Freixas). 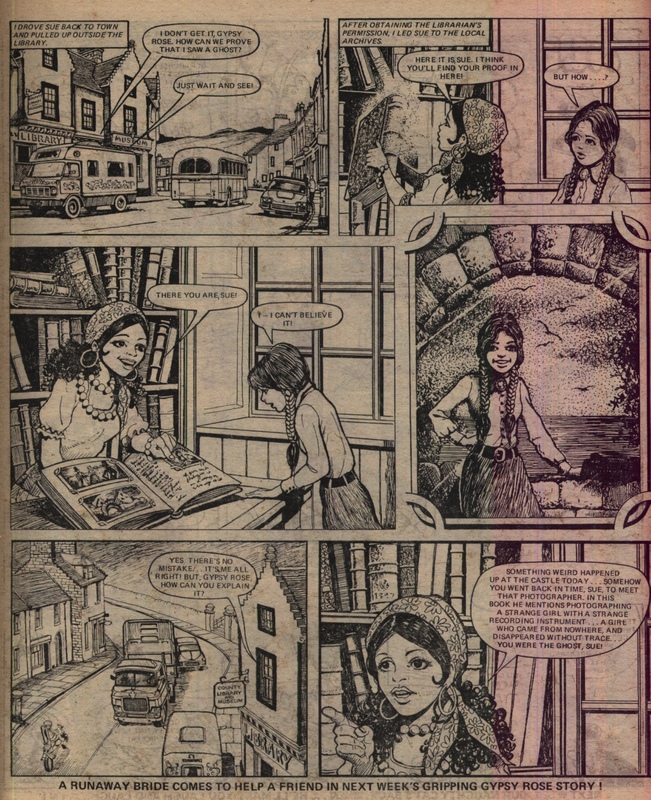 The Jinty Annuals ongoing also included a lot of material reprinted from June, often stories drawn by John Armstrong who also features in this Book; and writer Linda O’Byrne is clearly a carry-over from June too, though presumably writing new material for each Jinty Annual [edited to add – not sure why I said this last bit as Linda O’Byrne is not in either of my June Annuals!]. This gives the June book quite a similar feel superficially to the usual Jinty Annual. I think it’s also not too far-fetched to point to the logo for the two titles, which at least at this point in June’s evolution are quite similar, both featuring a golden-yellow colour and a slightly italic font. For another, without doing a detailed comparison, it seems to me that this June Book is probably an item with rather higher production values than the typical Jinty Annual. The majority of the pages are printed in two or more colours, though the artwork itself is not always coloured (an extra step of work is required for this of course, as well as potentially more expensive printing). 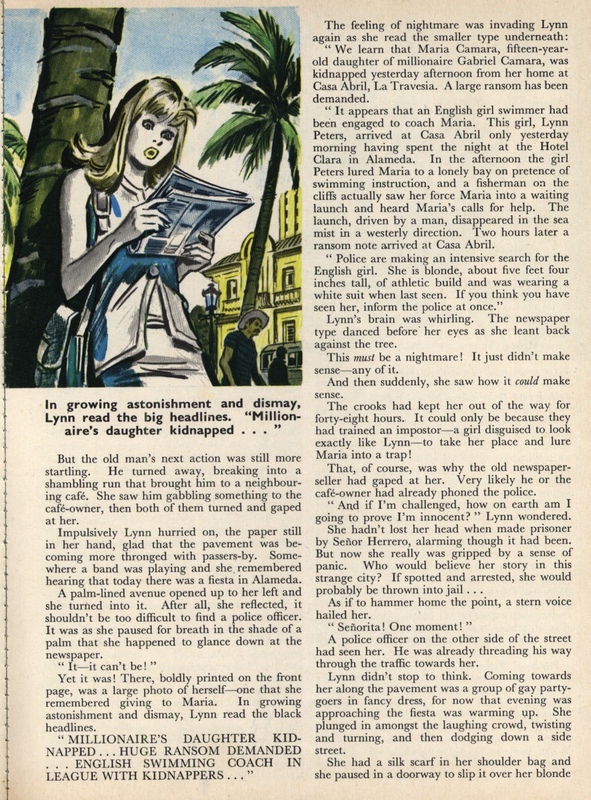 Comics pages such as “The Girl From Tibet” are produced in what looks like a line-and-wash technique, which again I think is likely to mean more expensive printing techniques for those pages. More of the writers are credited; this may or may not be associated with higher costs, but clearly they are ‘names’ that are worth printing, either because the agent for that writer has negotiated that, or because they are deemed sufficiently well-known to be worth it. And finally, nothing in this Book seems to be obviously reprinted from earlier publications; it has all been produced for an annual in this printing format, and looks like it is all original material. This is quite a big difference from the typical Jinty annual of latter times. Now this is a proper Jinty annual! It has lots of recognizably Jinty artists (Jim Baikie, Trini Tinturé, Ana Rodriguez, Terry Aspin), plenty of good solid stories, and a nice long complete story that has intrigue, sports, and dramatic cruelty. Oh wait, that last bit makes it sound like Tammy too! “House of Secrets” is a straightforward-enough ghost story with a happy ending; Ken Houghton’s art seems a little on the stiff side here, but overall the story works well. 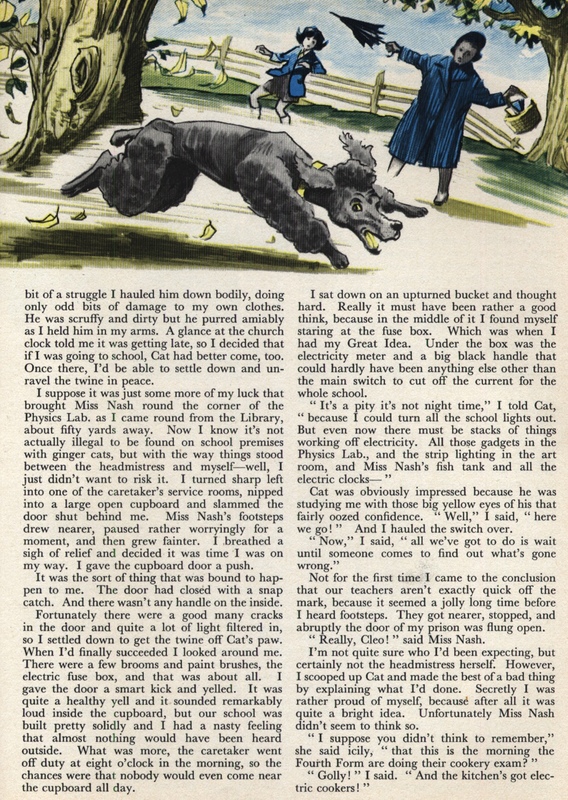 Text story “For Love of Smudge”, illustrated by Terry Aspin and written by Linda O’Byrne, is a read that gives more back; the plot of fed-up mother manipulated by a so-called friend, all of which impacts badly on the girl protagonist and her dog Smudge, raises it from being a straight-forward animal story. 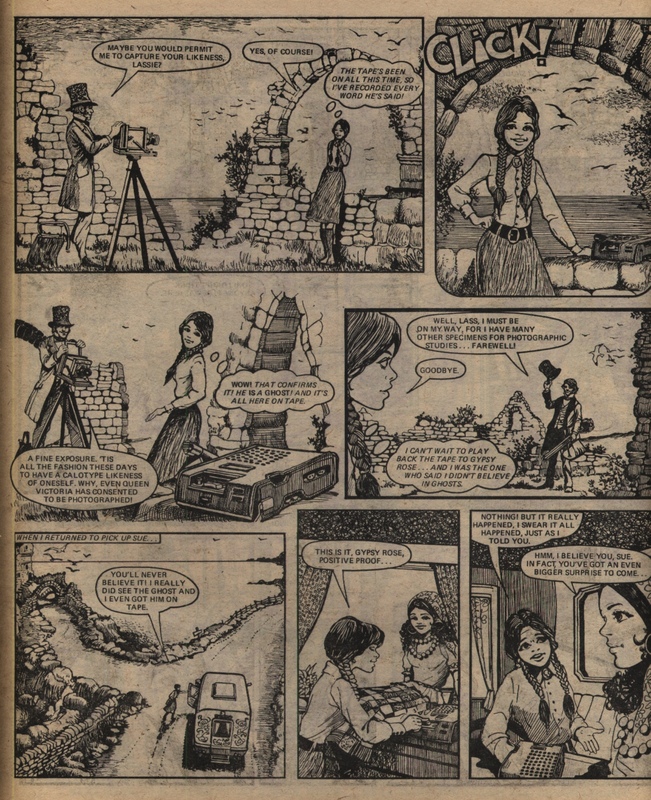 The Dora Dogsbody story is here drawn by Jim Baikie; it’s nice to see a Jinty regular even when drawn by an unexpected artist (if also a Jinty regular himself). 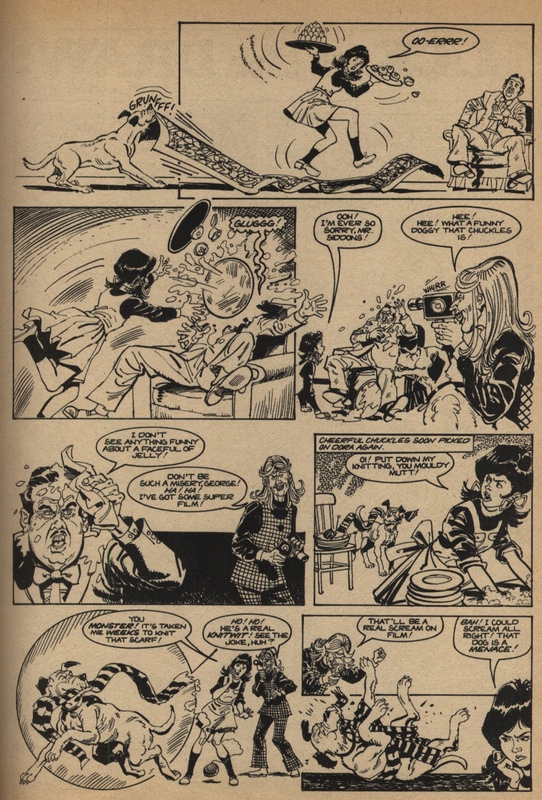 Baikie does a good job but I can’t help feeling that his Ma Siddons, in particular, ends up rather more hag-like than when drawn by the more slapstick Casanovas. 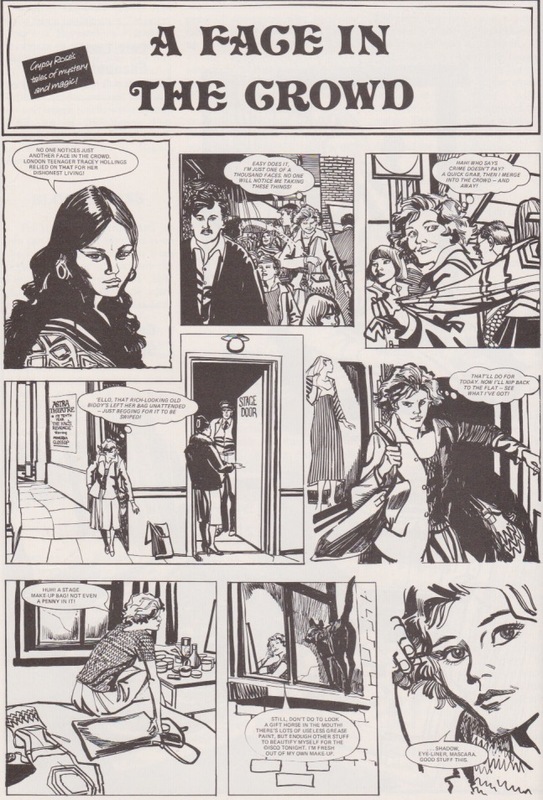 “Shelagh’s Shadow” is the long story, presumably reprinted from June. 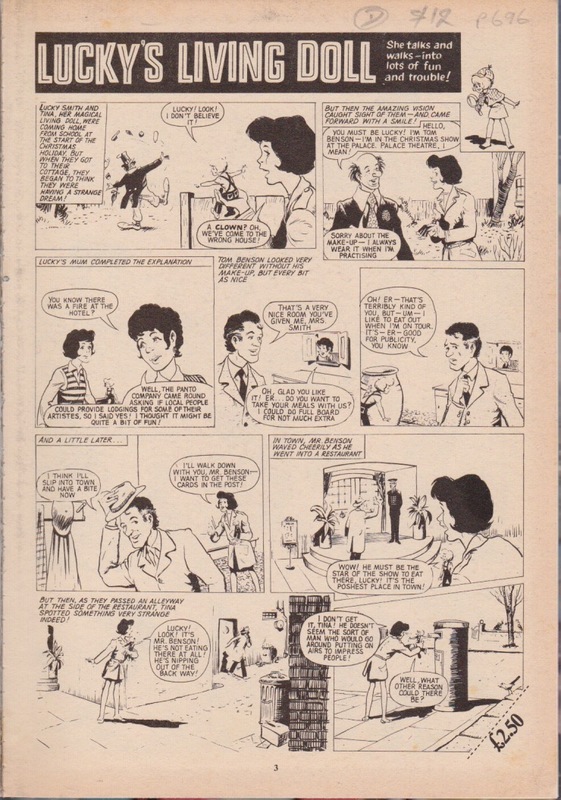 I guess that when that title ended, John Armstrong moved in directions that did not primarily include Jinty – he was featured in Tammy, of course, and I suppose that might have taken up a lot of his time until he was perhaps brought over to Misty by Pat Mills. This story has great swimming and diving sequences, and the strong depiction of facial expression that Armstrong is particularly good at, so it must have been right up his street. Ann Brent is the mysterious girl who shadows swimming champ Shelagh; Ann is under the thumb of her frightening guardian and swimming coach and multiple layers of deception need to be unravelled before the end. 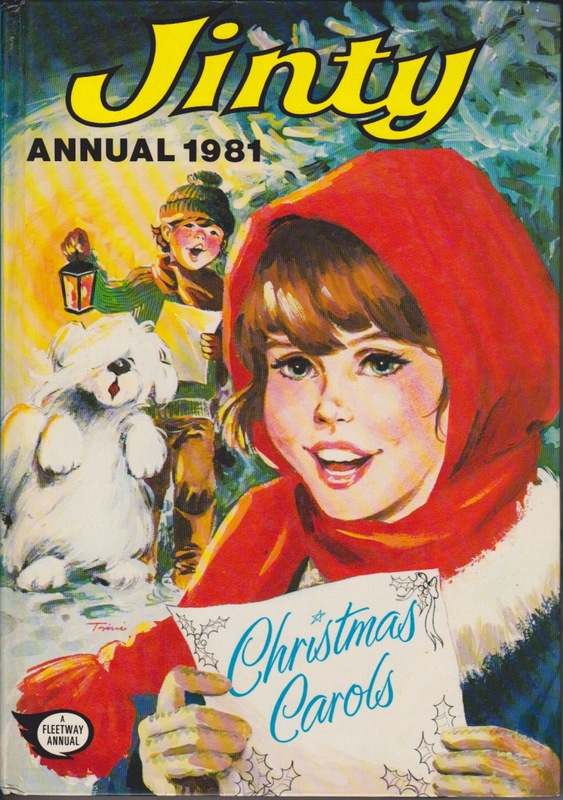 Mistyfan has posted about the 1982 annual which includes a good dose of Gypsy Rose stories; Gypsy Rose had just about started in Jinty by now but perhaps was not solidly enough established to feature in the annual? For whatever reason, all the strange storyteller spooky tales in this annual were ‘Uncle Pete’ reprints. The second to last of the stories reprinted has a signature showing it is by Alberto Salinas, a beautiful Spanish artist. There are two outings for the artist I think is the “Concrete Surfer” unknown artist – the first in the complete short story “Black Friday” (thrilling adventures with wildlife and the wild outdoors). This is competent but looks like an early outing for this artist as a comics artist. The text story “Naomi’s Moment of Truth” has rather more polished artwork which works well; the story is one of broken friendship and lesson-learning, quite realistic actually. 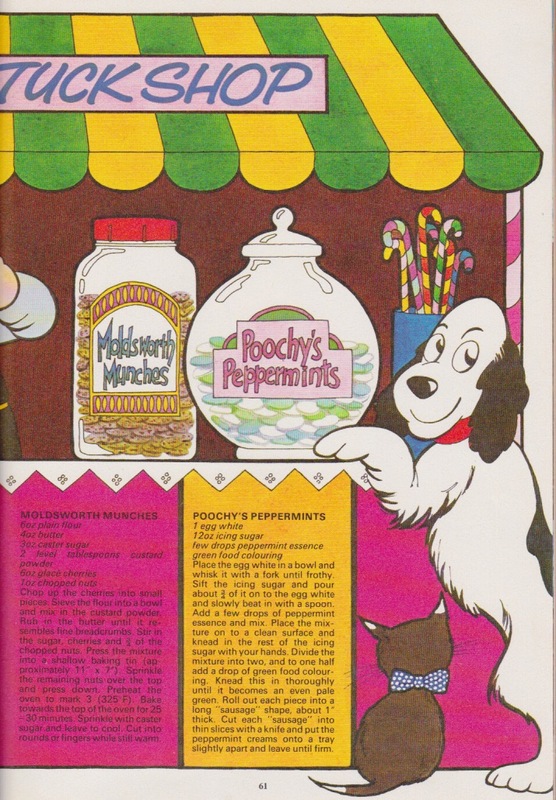 I don’t have the 1982 Annual that Mistyfan acclaims as possibly the best of the Jinty annuals; nevertheless, this is a great one well worth looking out for. 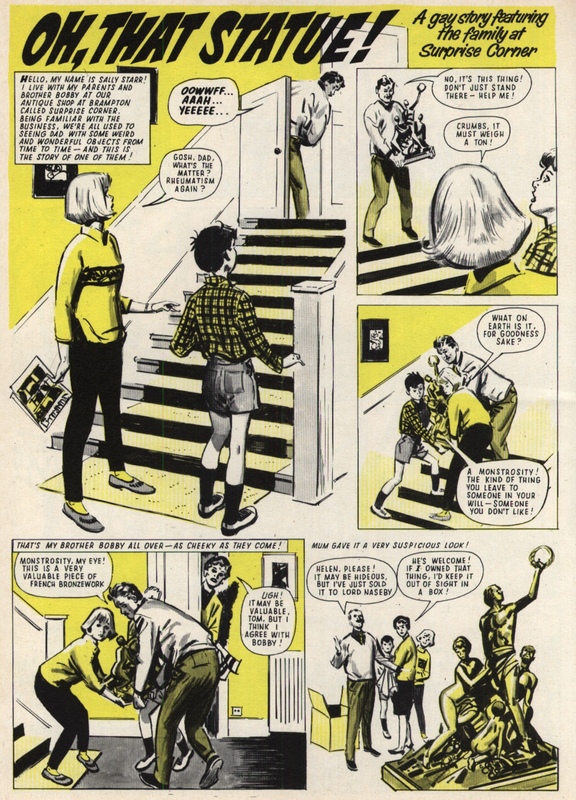 The “dumbo” editor left Pam of Pond Hill out of the previous annual, so it’s a delight to see her here this time, and leading off first place in the annual as she did in the regular comic. Pond Hill profiles the Christmas content by entering a Christmas drama competition. But kids from a rival school, Elmhurst, try to destroy their play. This is ironic, considering that many of the performers think the play’s awful (old fashioned, soppy songs and costumes, grim ending). Even more ironic, Elmhurst’s sabotage leads to a reworking of the play that is more to the kids’ taste (disco music and clothes, comedy, happy ending) and they perform it with such enthusiasm and originality that they win the competition. Talk about blessings in disguise. 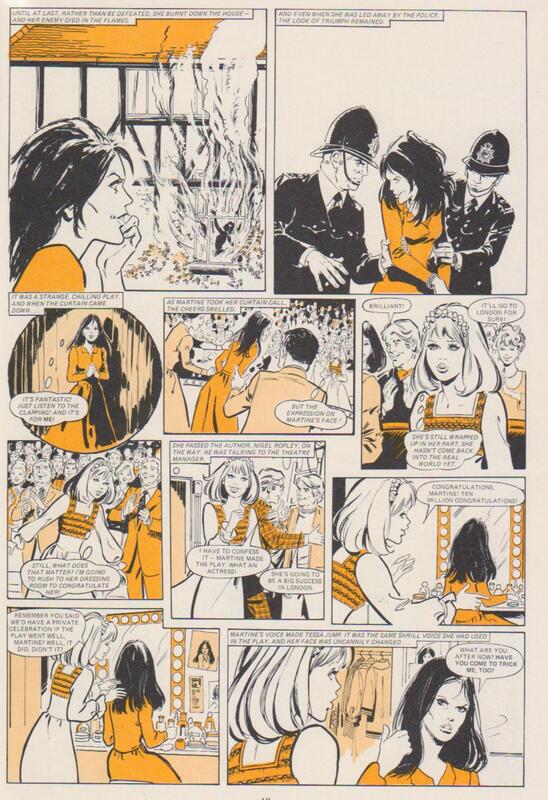 However, this was the only time a Pond Hill story featured in a Jinty annual, which seems a bit sad. 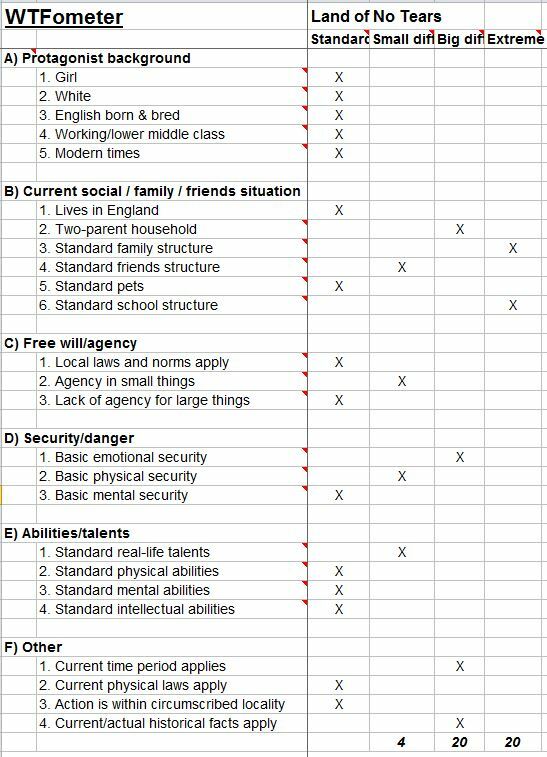 Trivia note: In this story, it is revealed that Mr Gold “Goldilocks”, the headmaster of Pond Hill, is married. 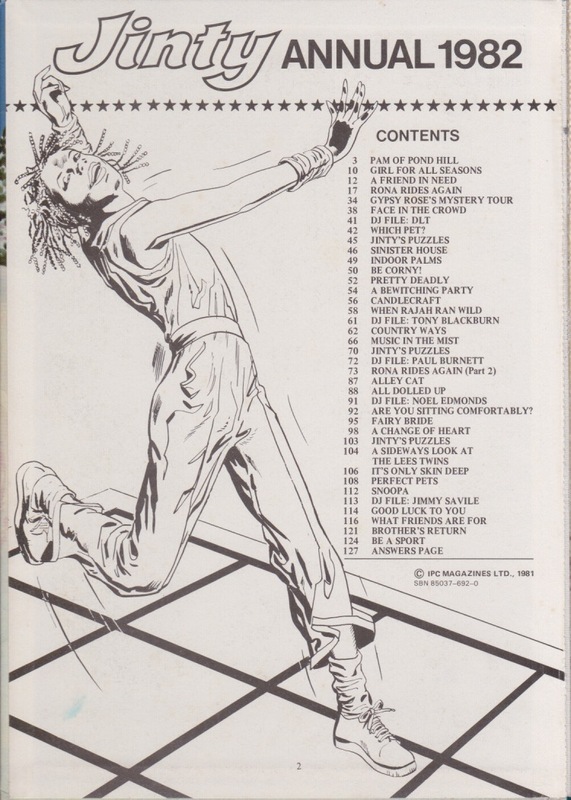 Disco also features on the inside cover, with Nadine from Life’s a Ball for Nadine doing a spot illustration with her disco dancing. She would do the same with the next annual. Is she here just to be a filler or does it say something about how popular she was? Gaye’s Gloomy Ghost makes no appearance at all, which seems odd. In fact, he never appeared in any Jinty annual. But most of the regulars are there – Pam, Alley Cat, Snoopa and Gypsy Rose. Some of the regular artists, such as Phil Gascoine and Phil Townsend, are also absent for some reason. Perhaps it was lack of room or Jinty wanting some different artists. 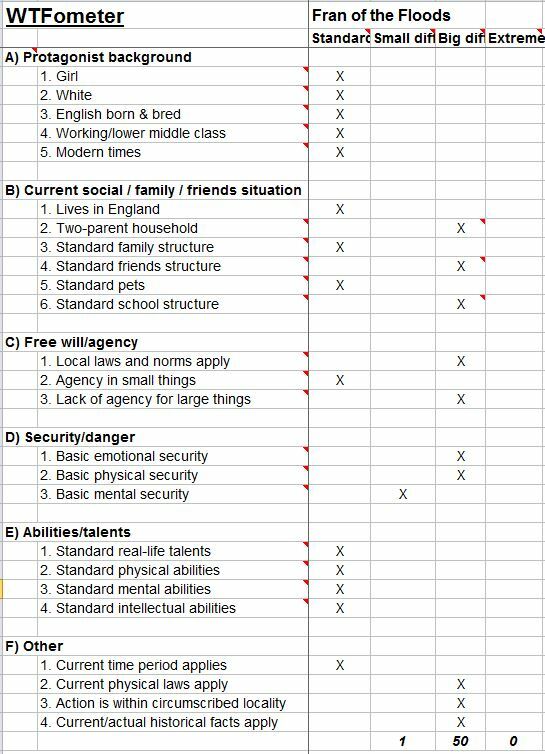 The Gypsy Rose content seems higher than usual. In fact, Gypsy Rose has her very own feature, “Gypsy Rose’s Mystery Tour”, in which she takes us to some of the haunted spots in Britain, and it is a fascinating read. Pity they didn’t redraw Gypsy Rose herself for it as the paste-up of her here is awful. The head is Maria Barrera’s art, but the body is clearly done by another artist. 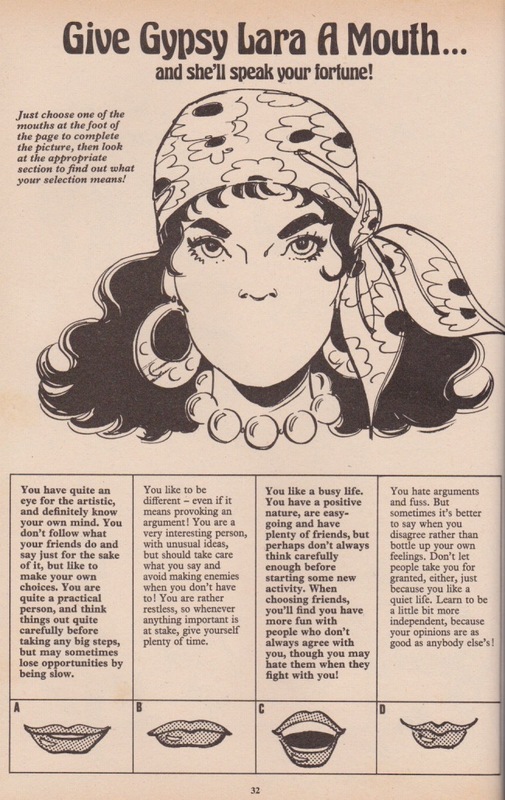 Most of the Gypsy Rose stories are recycled Strange stories, but one story, “A Face in the Crowd” is a surprise in that it is not only original (no paste-up on Gypsy Rose) but Gypsy Rose herself is drawn quite differently. Instead of her headscarf and gypsy top, her head is bare and she wears a shawl. She also has a slightly older and sharper look than usual, which is brought off effectively by the linework of Tony Higham. Higham himself is also a surprise, a most unusual choice to draw Jinty material. Perhaps they thought his style was the one to bring off the hag face the thief’s face turns into once she puts on the makeup – her comeuppance, of course. 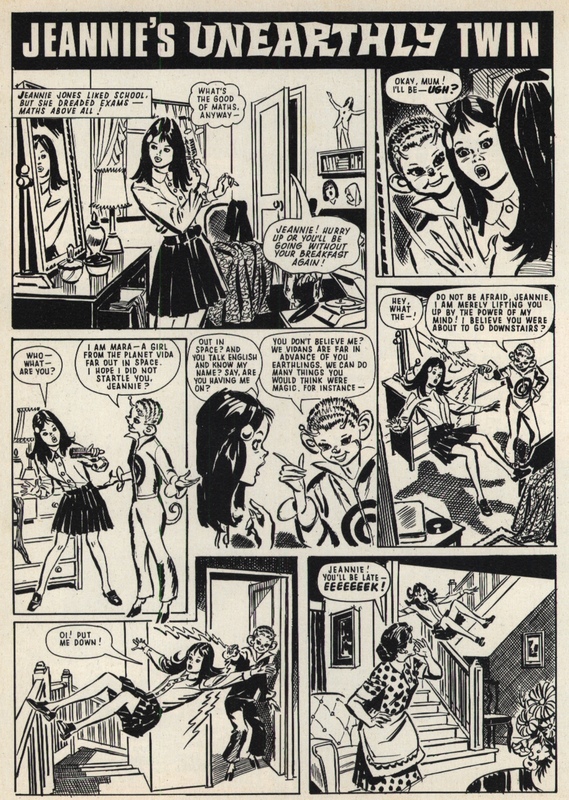 I like one Gypsy Rose story, “Sinister House” for its take on an extremely common theme in girls’ comics – a spiteful girl who causes trouble for a foster girl, and can get away with murder because she looks so sweet and innocent. In this case our spiteful girl gets punished in the Misty-style manner. She feigns running away, but it backfires when she meets a deranged woman (who turns out to be a kindred spirit) who scares all the spite out of her. Readers are left to ponder if it was a dream, time slip or a ghost. 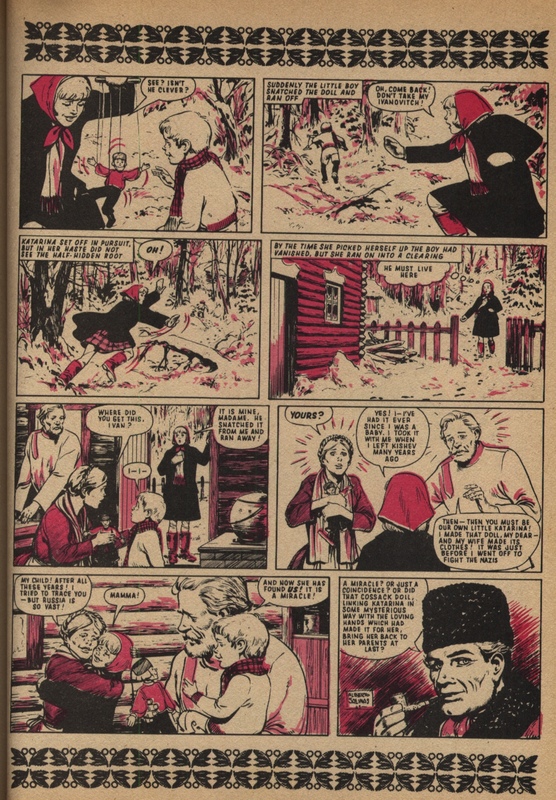 This was the last Jinty annual to reprint a serial from another comic. 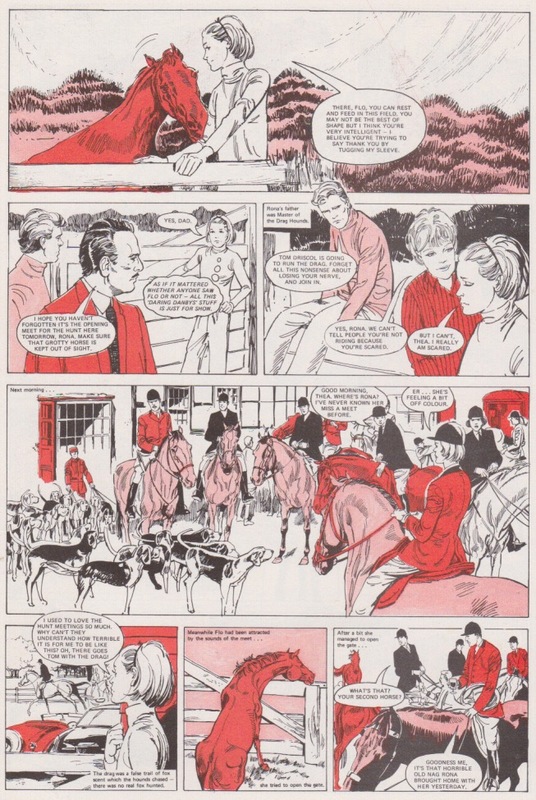 But this time it is from Tammy, not June, so Jinty readers are treated to Eduardo Feito’s brilliance in drawing horse stories with “Rona Rides Again”. Rona Danby loses her nerve after a fall and her family handle it badly (typical). They think it’s a disgrace to the family name as they are a line of proud horse riders. They get even more annoyed when Rona rescues an ill-treated nag, Flo, and bring her home. As you might expect, Rona’s friendship with Flo helps her to get her nerve back. 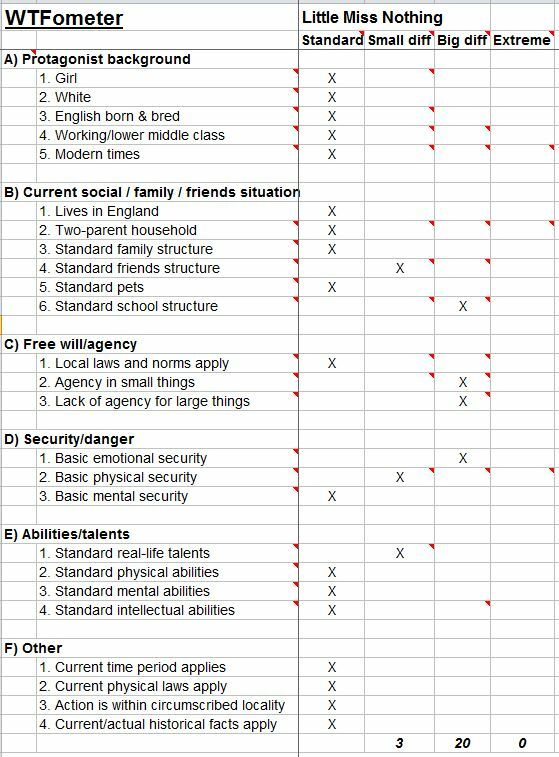 But there’s a snag – Flo seems highly-strung and badly behaved at times. If Rona can’t find a way to sort out the problem, Flo could be destroyed. 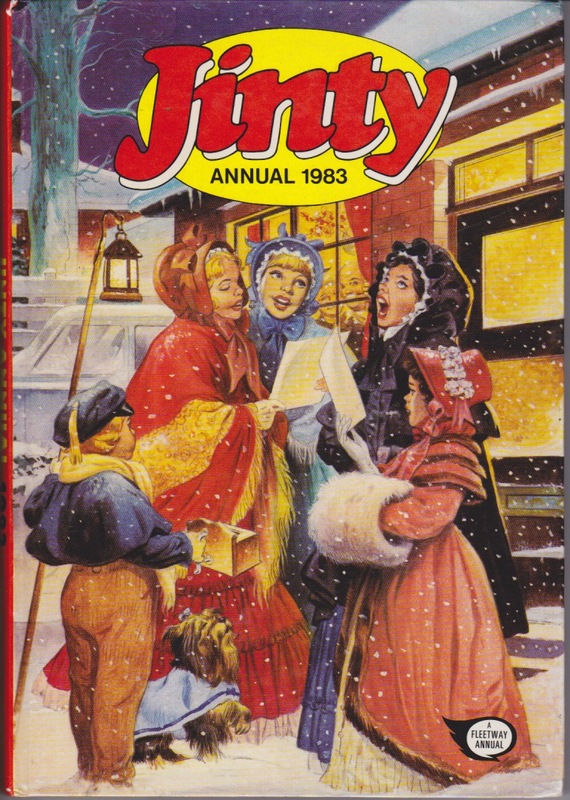 This has to be one of Jinty’s best annuals, perhaps even the best one of all. The content is strong, and the presence of Pam makes it feel even more like Jinty. It even has a few surprises in the Gypsy Rose sections. It also gives readers a real treat of famous DJs and pop stars, which would have made the annual even more of a delight to receive on Christmas Day. 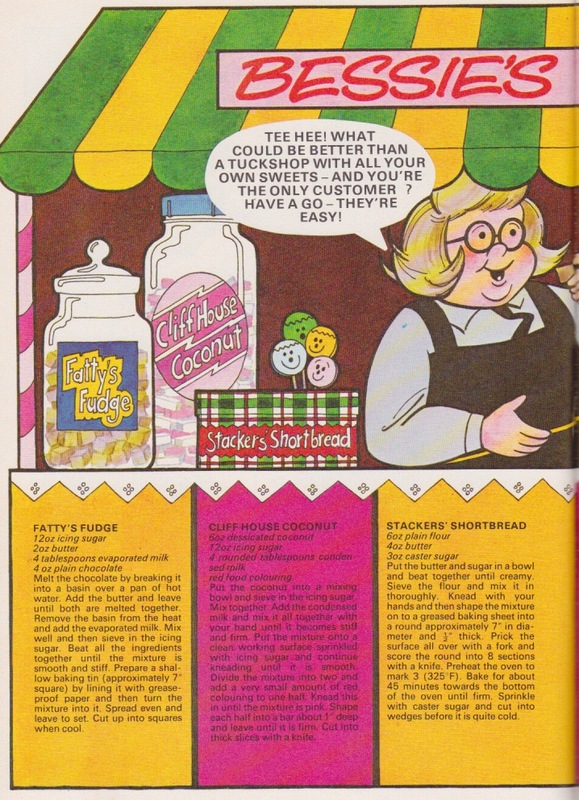 Pam of Pond Hill headed the advertising for this annual in the regular comic. Perhaps it was the “dumbo” editor’s way of making it up to her for omitting her from the annual and saying it was too late. 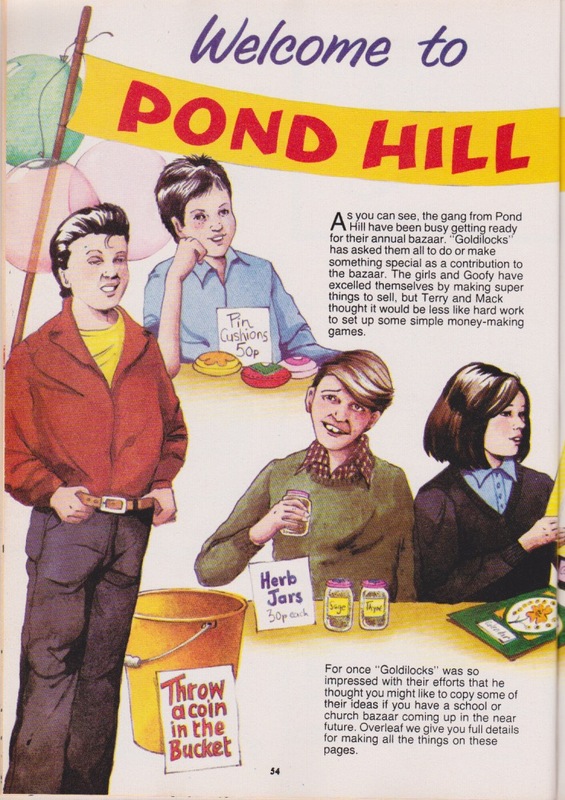 In fact the only Jinty annual to have a Pond Hill story would be the 1982 annual. 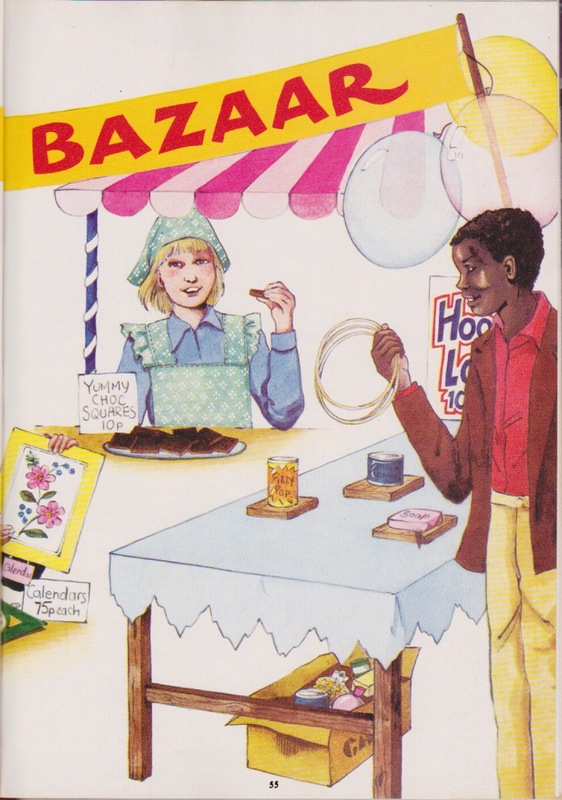 The 1983 annual had a Pond Hill feature, which was on its annual bazaar and instructions for the items and games the bazaar had on offer. 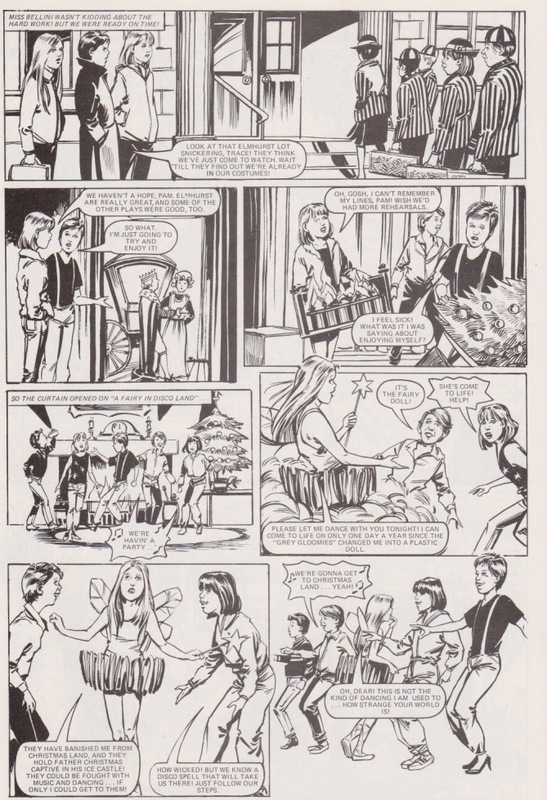 The 1984 annual had no Pond Hill content at all, and the next two had no Jinty content altogether. 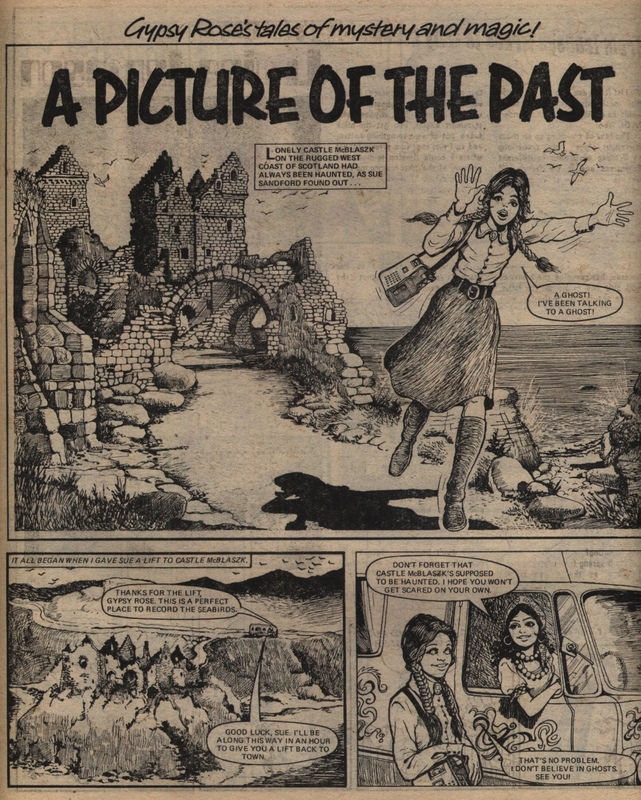 The 1981 Jinty annual was the last to reprint a June serial, which was “She Couldn’t Remember!” A girl wakes up in hospital and finds she has completely lost her memory. Everyone calls her Sally and the nice woman who visits her in hospital claims to be her mother. But it doesn’t feel right and it soon becomes apparent that it’s not adding up either. It’s not your typical story about people taking advantage of an amnesic girl. As the story develops, it becomes apparent that someone does not want “Sally” to regain her memory and they are resorting to drugs to do it! And by the looks of the two horrible-looking men she begins to remember, it could be very dangerous if she does remember who she really is. And how is the so-called mother mixed up in it? 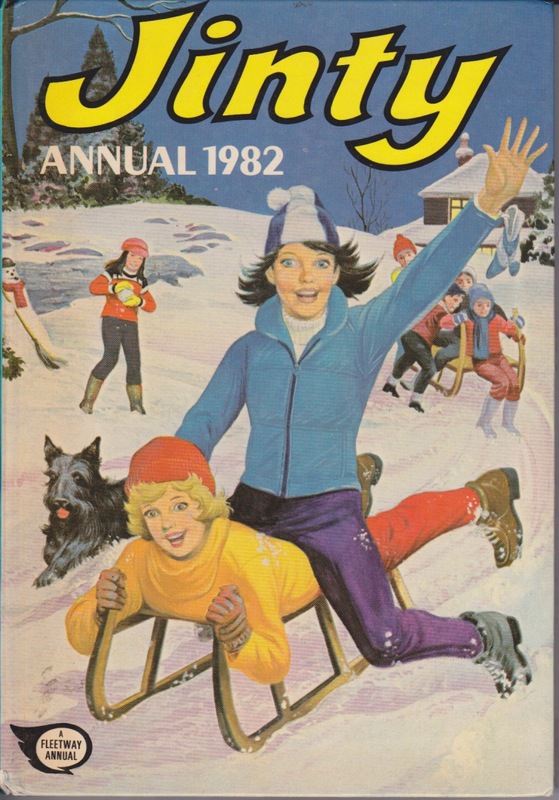 Strangely, the next annual reprinted a Tammy serial, “Rona Rides Again”. 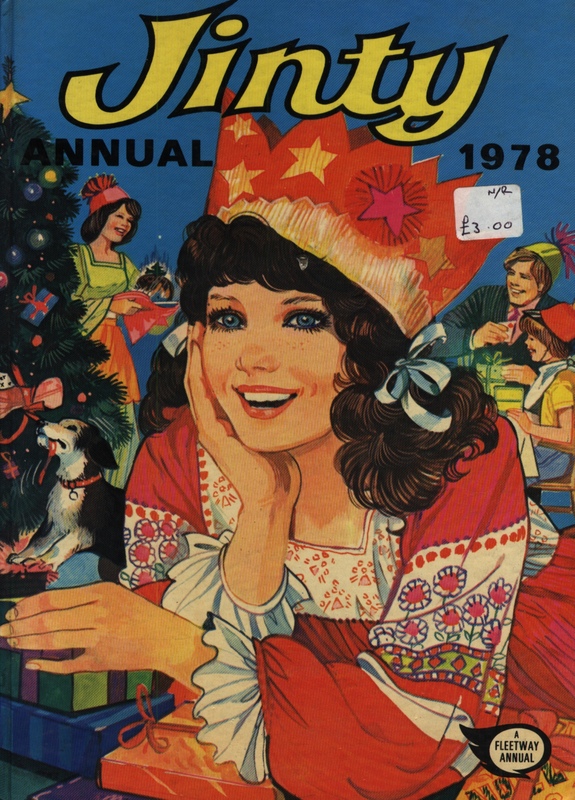 Pam may have missed out on this annual, but the Jinty characters to make it were “A Girl Called Gulliver” in a Christmas story, “Lilliput Christmas”, “Bizzie Bet and the Easies”, drawn by Hugh Thornton-Jones (and for once, the Easies don’t get the last laugh on Bet), and Gypsy Rose, albeit with reprinted Strange Stories. The Lilliput story is unusual as the original story was a serial, not a regular feature. 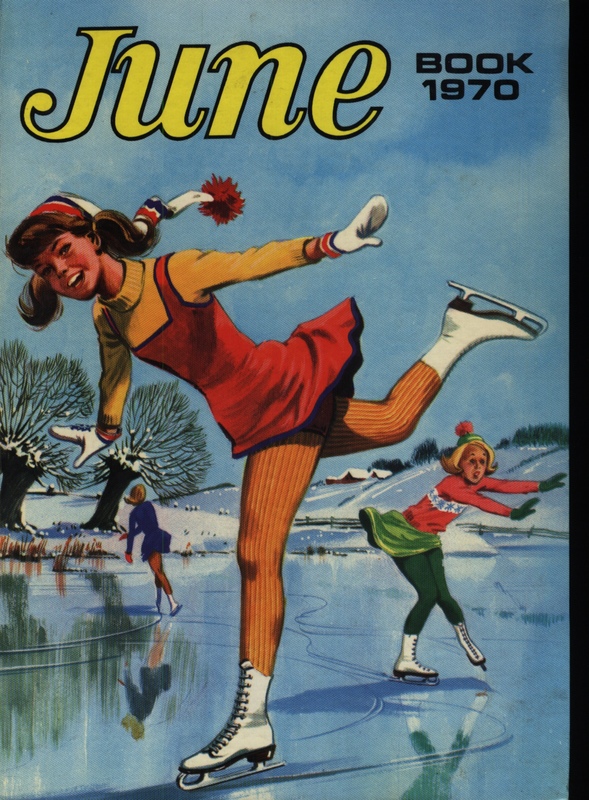 It was extremely rare for Jinty to publish sequels to serials in her annuals. It shows how popular “A Girl Called Gulliver” must have been. 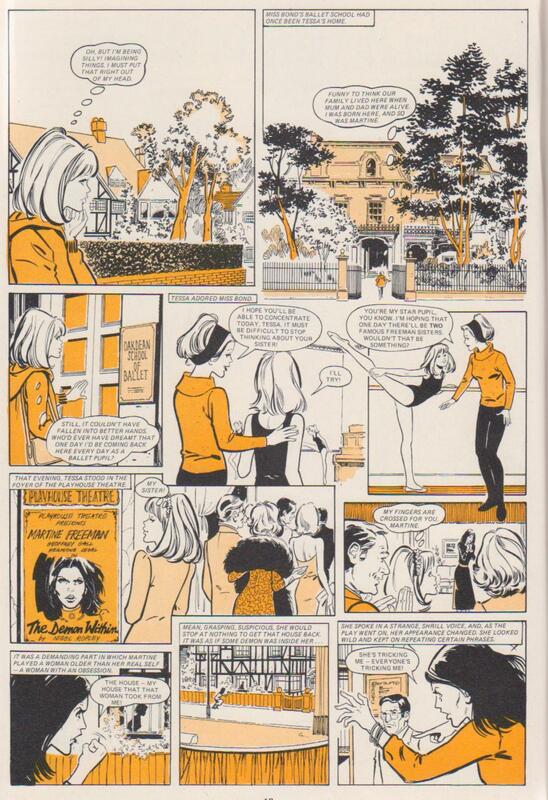 “Gaye’s Gloomy Ghost” is another curious omission from the annual. Come to that, it never appeared in any Jinty annual. What could the reason have been? Alley Cat and Rinty ‘n’ Jinty are also present. 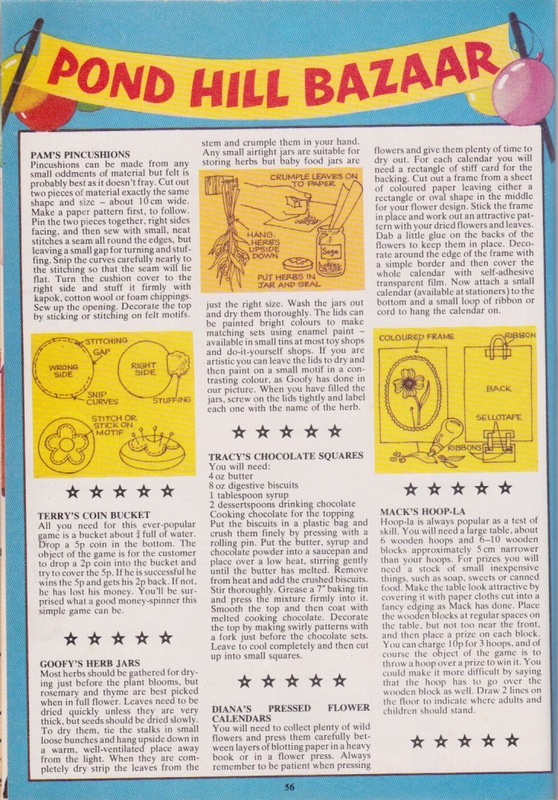 Oddly, Jinty reprinted some Brenda’s Brownies, who never appeared in the regular Jinty. 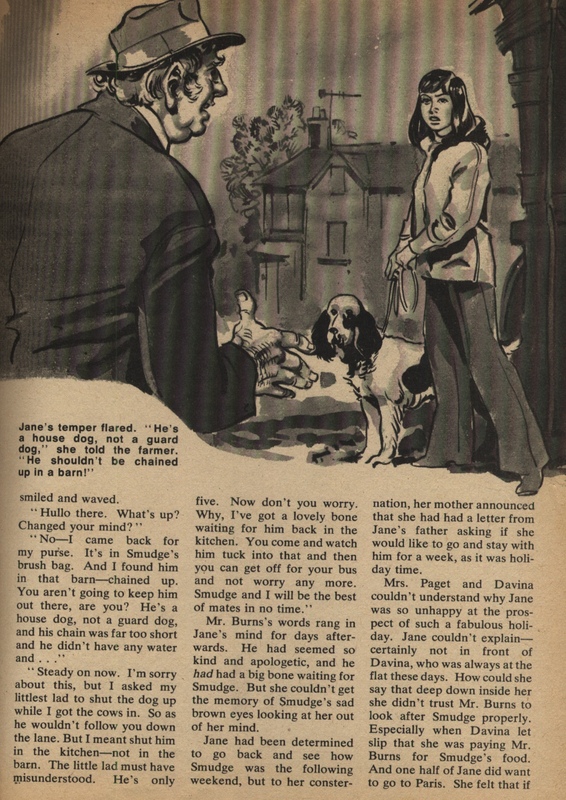 Couldn’t Jinty have made more of an effort there in printing her own material such as another Alley Cat story instead of resorting to a somewhat lazy filler? There is no “Fran’ll Fix It!”, but we do get a Jim Baikie story that looks like it was actually drawn for this annual instead of a reprint of early Baikie from June or whatever. We have to wonder if there are shades of Baikie’s “The Forbidden Garden” as this one is called “The Lost Garden”. 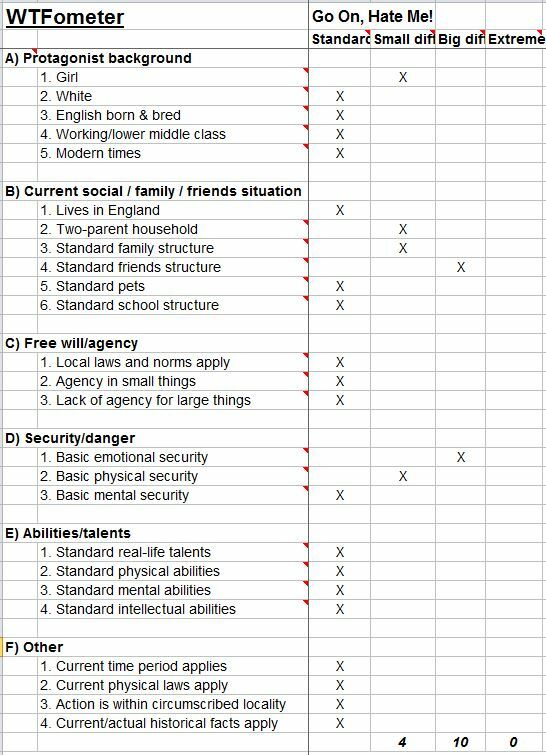 Janey is orphaned and only her relatives, though they don’t actually ill-treat her, don’t love her at all. They didn’t even want her in the first place and only took her in because there was nobody else. A rose bush from her old home is her only solace, and her quest to find a garden for it leads to new happiness and guardians who are suitable. “Mirror of Tears” is an unconventional take on the Christmas fare that is routine in a girls’ annual. It is a story of a Christmas haunting that threatens to ruin the Dales’ first Christmas in their new home because Christmas is the anniversary of when it all started. A Victorian girl was looking forward to a present from her father, but all she got for Christmas was tragedy when he died in an accident. Powerful stuff, guaranteed to make readers cry. 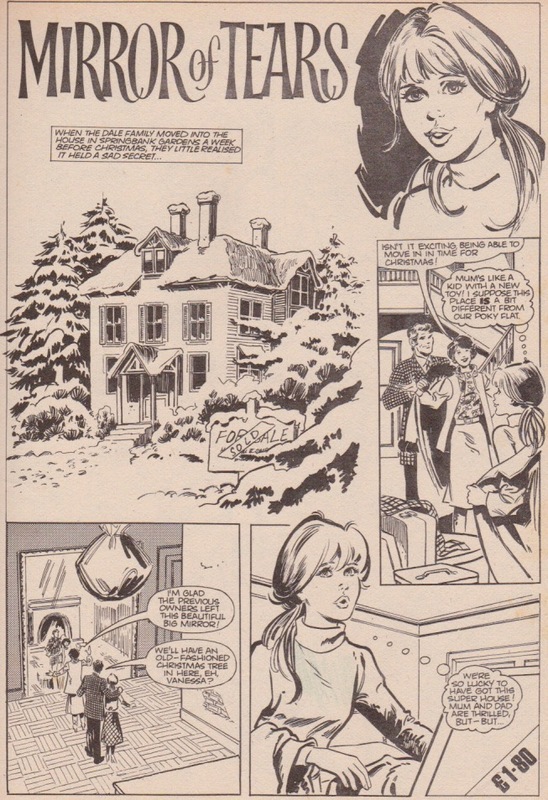 So will the solution – Vanessa Dale giving the ghost the present she received from her parents. And it was a sacrifice that showed all the spirit of Christmas as the parents can’t afford much at the moment. This has to be one of Jinty’s best complete stories ever and it well deserves to appear first in the annual. “Boo to the Goose!” is an amusing twist on the saying about shy people not able to say boo to a goose. Gillian’s mother is fed up with her being such a pushover and tells her once and for all that she must learn to say boo to a goose. But she does not count on a real goose teaching Gillian that lesson or walking in with it for a pet! This is a pretty solid Jinty annual. 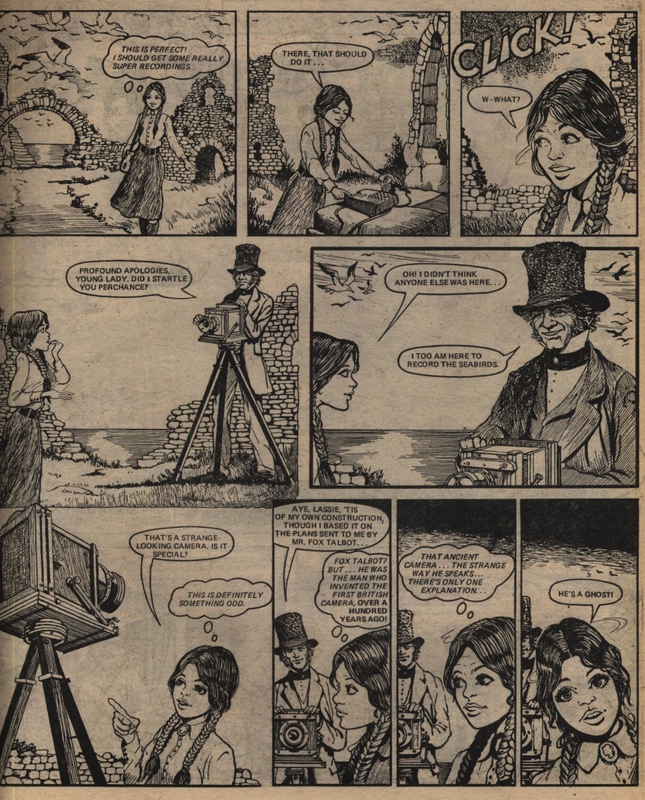 Although it has some reprints of older material, the Jinty stories are strong, with perhaps “Mirror of Tears” taking top honours, and it is terrific to see them drawn by Jinty’s regular artists. Its only real demerit point is the absence of Pam – what did the editor mean when he said it was too late to include her when she had been running in Jinty for about two years? The annual would have been even better with Pam in it.